Corbett Auctions & Appraisals Inc., has been working with numerous charitable organizations, schools, and associations since 1991; providing consulting services, professional auctioneers, and emcees, as well as clerking, cashiering, and credit card services for fully-staffed, full-service auction events. Whether it be a black-tie event or a casual affair, we have the auctioneers and staff to help produce the event and make it a success! We have the ability and resources to conduct more than one event per evening. If you see that your preferred date is already booked, please contact us to discuss your needs. Many groups book their events up to two years in advance to ensure their organization will have the professional service that reflects their groups’ image. We understand the importance of your event. It is not only a very important time of fundraising but also a social event, and prime opportunity to create good will for donors who may be considering your group in their estate planning. Unlimited pre-event consultation: order of auction to room layout. Whether your group is just beginning or has been producing events for years, we can advise you on everything from the most successful timeline for the evening to the order of items to be sold. We understand that this is your night and our advice is just that…advice. 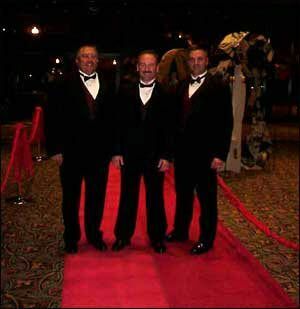 We will conduct your event with the timeline and process that you and your group determine best suits your goals. Many overlooked items are: the proper public address system for the room and number of attendees, room layout, lighting considerations, and table décor that can impede the line of sight for the auctioneer. Also, proper starting time, and order-of-sale for the type of event, and demographics of the group. Yes, there is a fee for our services. Our goal is to add substantially more value than our fees “cost.” Our professional and entertaining manner, and the value of our optional accounting services, will guarantee a successful and fun event. Whether you are utilizing the services of a doctor, lawyer, or auctioneer, the biggest questions are experience, quality, and performance. Our “Fast Pay” system can eliminate the check-out line so that guests leave with a smile. Our greatest compliment has come from groups that have hired us, over utilizing donated services of perhaps less-seasoned auctioneers or auctioneers that are not benefit auction professionals. Our auctioneers never work alone. Events such as yours take considerable planning, time, and resources of multiple committees and volunteers. Many groups spend an entire year planning for the next event. If something were to happen to the auctioneer, what would you do? We have received frantic calls from groups that have had their auctioneer call in sick or had a change of plans. We eliminate this concern by providing a minimum of two combination ringmen/auctioneers that can both auction and assist. On many large events, we provide four auctioneers/ringmen that have the ability to rotate between selling, announcing, and working with the crowd. Our auctioneers are Idaho State Champions….the show will go on!